I’m starting out the week with the easiest and yummiest melt-in-your-mouth, no-cook, refined-sugar free fudge. I always know when a recipe is good by how difficult it is for me to take photos of the finished product. Without eating all of it. This fudge is so good, I barely got enough pictures before it was all gone! That’s when I realized I needed to double the recipe. If you read my post Sweet and Creamy Tahini Maple Fruit Dip & Why You Should Eat More Tahini, then you already know two things: I love pairing tahini and maple syrup, and tahini is a secret treasure trove of nutrition. Sesame seeds (and tahini or sesame butter/sesame paste) are a good source of essential minerals (especially copper, magnesium, phosphorous, zinc, and iron), protein, and antioxidants. Tahini is good for your heart, prevents cancer, and helps keep bones strong. It also contains many of the important nutrients needed to maintain healthy skin and hair. Plus, it is so versatile! I use it in salad dressings, savory recipes, and I really love using it to whip up simple sweet treats, like this fudge. This fudge could not be any easier. Simply stir the 3 ingredients together in a bowl, pour into a shallow dish or silicone ice cube tray and pop it in the freezer until firm. 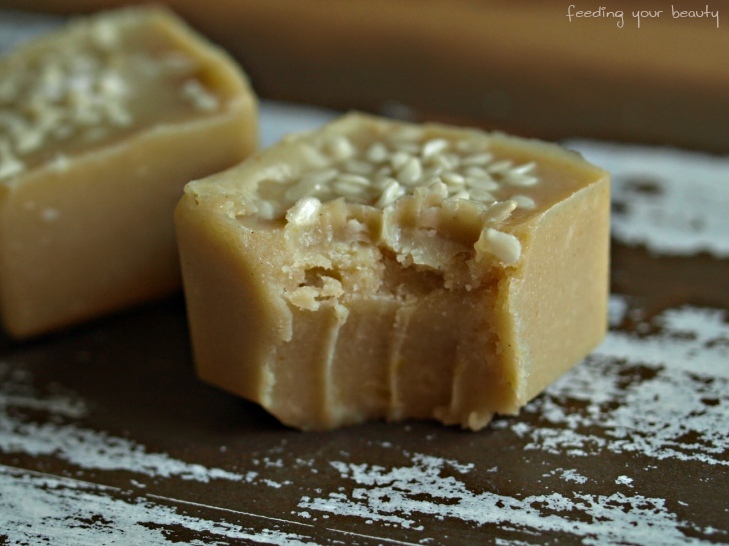 I love the smooth, creamy texture, maple-y sweetness, and touch of sesame seed flavor. It’s like peanut butter fudge’s exotic cousin. If you really want to kick up the flavor a notch, I suggest trying my lemon-ginger variation below. It is so delicious! I hope you give this one a try, friends! Stir together ingredients until smooth and well combined. Pour into a silicone ice cube tray (makes about 6 cubes) or a small shallow dish. Put into freezer until firm (it will stay soft and creamy even in the freezer). Pop out of ice cube tray (or cut into squares if using a small dish) and enjoy!